From around 1917, Sydney artists Roy de Maistre and Roland Wakelin began exploring the power of colour to connect art and music. They experimented with colour to produce synaesthesia, the condition in which the stimulation of one sense leads to an automatic, involuntary response in another. De Maistre was particularly interested in global theories of correspondences between colour and music. His compositions systematically represented music in terms of colour: colour signified particular musical notes, the depth and lightness of colour stood for pitch, and the varying saturation of colour corresponded with musical volume. These experiments culminated in de Maistre and Wakelin's joint Colour in art exhibition in 1919 featuring small, colour-music 'syncromies' that prompted the first wave of abstract painting in Australia. 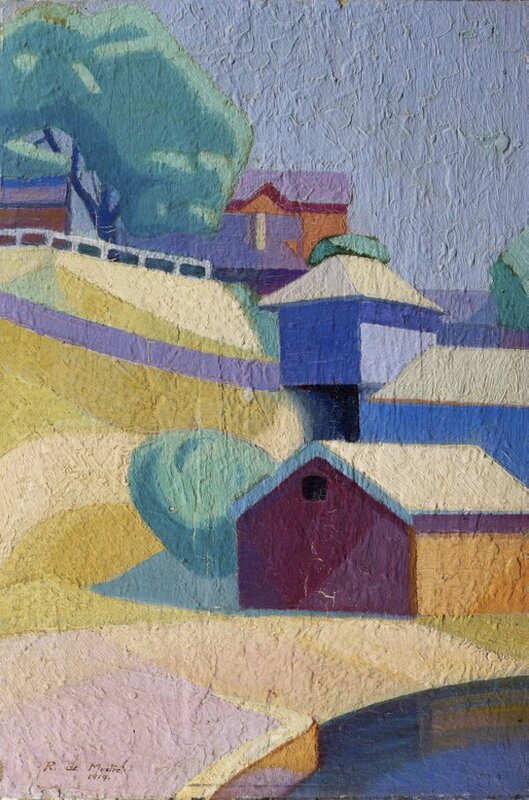 While based on images of local scenes around Sydney's harbour landscapes (mainly around the Harbour's Berry's Bay), their works were intensely coloured, radically simplified and anti naturalistic. 'The boat sheds, in violet red key' is one of only three paintings known conclusively to have been included in this seminal exhibition of Australian modernism. The painting demonstrates de Maistre's new dealings with colour and simplified form – taking colour beyond descriptive towards constructive and decorative uses. In such works, de Maistre (and Wakelin) did not dispense with representational content to suggest musical form, but rather invited the viewer to see the landscape in terms of colour, light and geometrical simplification. In doing so, they assumed a more expressive, chromatically heightened sense of harmonious unity in their painting. Signed and dated l.l., brown oil "R. de Mestre/ 1919. ".